BMW Oracle wins America`s Cup | Marbella Marbella – Adelante! Billionaire software mogul Larry Ellison won the America’s Cup on Sunday by following the same aggressive rules he has perfected in business: Push the envelope on technology. Don’t be afraid to spend money. And make the competition personal. 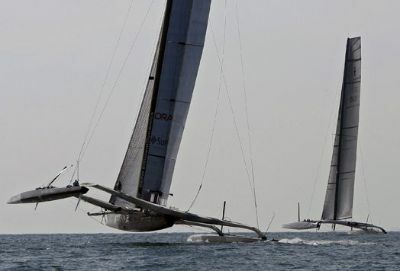 The pugnacious Oracle CEO and the crew of his 114-foot, high-tech trimaran became the first U.S.-sponsored team in 18 years to win the world’s oldest sailing trophy, after trouncing the Swiss Team Alinghi in successive races — the first was Friday — making a third event unnecessary in the best-of-three competition off the coast of Spain. “It’s an absolutely awesome feeling. I couldn’t be more proud to be a part of this team,” Ellison, who was on board for the race, told a TV crew on the scene moments after the BMW Oracle boat, dubbed USA-17, finished the second race 5 minutes and 26 seconds ahead of its rival. But the quick victory came after a years-long quest, into which Ellison, the world’s fourth-richest man, poured hundreds of millions of dollars from a personal fortune estimated at $27 billion. In addition, he waged an extended legal battle against his bitter rival, billionaire Swiss yachtsman Ernesto Bertarelli, to make sure the race was staged on what Ellison considered fair terms.